His father was the musician Vincenzo Galilei. His mistress was Marina Gamba and Maria Celeste was one of Galileo's daughters. 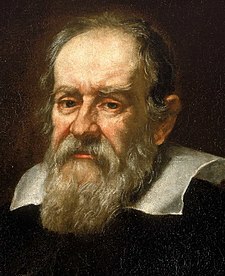 Galileo Galilei (Àdàkọ:IPA-it; 15 February 1564 – 8 January 1642) je ara Italia onimo fisiiki, mathematiiki, olutorawo, ati onimo oye to ko ipa pataki ninu Ijidide Sayensi. Die ninu awon aseyori re ni atunse si teliskopu ati awon akiyesi irawo to se, ati itileyin ise Copernicus. Won ti pe Galileo ni "baba itorawo oniakiyesi odeoni," "baba fisiiki odeoni," the "baba sayensi," ati "Baba Sayensi Odeoni." Stephen Hawking so pe, "Galileo, ju elomiran, lo sise fun ibi sayensi odeoni." ↑ Drake (1978, p.1). The date of Galileo's birth is given according to the Julian calendar, which was then in force throughout the whole of Christendom. In 1582 it was replaced in Italy and several other Catholic countries with the Gregorian calendar. Unless otherwise indicated, dates in this article are given according to the Gregorian calendar. ↑ 7.0 7.1 Weidhorn, Manfred (2005). The Person of the Millennium: The Unique Impact of Galileo on World History. iUniverse. pp. 155. ISBN 0-595-36877-8.